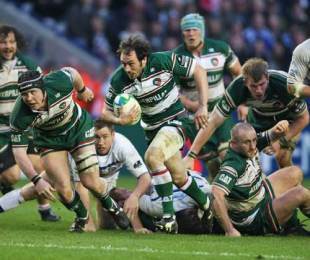 Guinness Premiership champions Leicester Tigers have agreed to release scrum-half Julien Dupuy to Stade Francais. Dupuy played a key part in Leicester's Guinness Premiership success last season and recently won international recognition for the first time, but the Tigers were powerless to stop the player leaving for personal reasons. Dupuy has been replaced by James Grindal, who rejoins the club from Newcastle Falcons. Grindal will now compete with England and British & Irish Lions scrum-half Harry Ellis for a starting role at Welford Road. "Allowing Julien to leave the club is a decision that has not been taken lightly, but he made it clear that, for personal reasons, he wanted to go back to France," said Tigers head coach Richard Cockerill . "Stade were willing to pay a substantial fee to take him there and we have to think of the squad as a whole when making these decisions. It would have been difficult to keep a player who saw his future elsewhere." Cockerill believes that Grindal will provide a boost to the Tigers, who faced the possibility of being without both Dupuy and Ellis for lengthy periods due to international commitments. "Julien came here as a squad player from Biarritz and he has enjoyed an excellent year in the Tigers environment, to the extent that this summer he is a starting selection for France," said Cockerill. "Now that he has made his debut for France, we could have faced the situation where we lose both him and Harry Ellis to international squads for significant parts of the season and that has also had a bearing on my decision. "We have a British & Irish Lions scum-half in Harry and we have had the emergence of Ben Youngs who we would like to see continue with his development. Now we have added James to the competition for the scrum-half shirt and we are very happy to be able to bring him in. "James obviously knows the Leicester culture after coming through the ranks here as a young guy and he has a lot of experience. He has played more than 150 first-team games for Newcastle and he is still a young guy. We look forward to welcoming him. "Julien had an added role as a goal-kicker with us last season and the transfer fee does allow us to have a look at our goal-kicking options if necessary."